Storage: Store at or below -20 ºC. Solubility: Soluble in DMSO at 50 mg/mL; soluble in ethanol at 30 mg/mL; very poorly soluble in water; maximum solubility in plain water is estimated to be about 5-20 µM; buffers, serum, or other additives may increase or decrease the aqueous solubility. Disposal: A.
Doramapimod is a protein kinase inhibitor with a >330-fold selectivity for p38 MAPK compared with 12 other protein kinases. In contrast to other p38 MAPK inhibitors (e.g., SB203580), doramapimod prevents both the kinetic activity and phosphorylation of p38 MAPK by binding to the ATP pocket as well as to a novel allosteric binding site on p38 MAPK. Branger, J., et al. "Anti-Inflammatory Effects of a p38 Mitogen-Activated Protein Kinase Inhibitor During Human Endotoxemia." J. Immunol. 168: 4070-4077 (2002). Inhibits ABL(T315I). Doramapimod blocked proliferation of cells expressing BCR-ABL(T315I), with an IC50 of 2-3 µM; this is more potent than for cells expressing BCR-ABL with no resistance mutation (IC50 > 10 µM). Doramapimod prevented BCR-ABL(T315I) autophosphorylation in Ba/F3 cells (IC50 = 1-2 µM). By comparison, imatinib did not inhibit BCR-ABL(T315I) in this assay, even at 10 µM. Carter, T.A., et al. "Inhibition of drug-resistant mutants of ABL, KIT, and EGF receptor kinases." Proc. Natl. Acad. Sci. USA 102: 11011-11016 (2005). 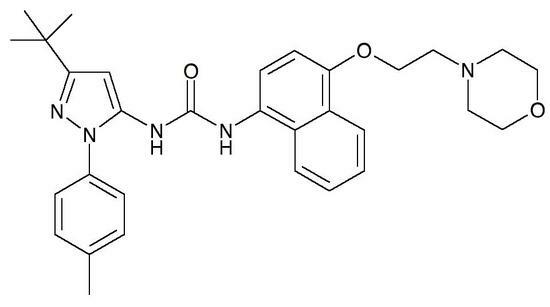 The p38 inhibitor doramapimod binds tightly (Kd = 40 nM) to ABL(T315I) and inhibits the BMS-354825- and imatinib-resistant ABL(T315I) kinase. Fabian, M.A., et al. "A small molecule-kinase interaction map for clinical kinase inhibitors." Nat. Biotechnol. 23: 329-336 (2005). Doramapimod has high picomolar affinity (Kd = 100 pM) for p38 MAP kinase and low nanomolar inhibitory activity (IC50 = 18 nM) against TNFα in THP-1 cell culture. The association of a fluorescent analog of doramapimod to p38 MAP kinase is slow and the dissociation is even slower. The high overall binding affinity of doramapimod is due to a reduction in the dissociation rate constant. The apparent IC50 value decreases as the preincubation time increases. The time-dependence of apparent inhibitory potency and the fluorescent binding assays confirm the slow binding behavior of doramapimod, which is apparently required for the conformational change of the binding site. Pargellis, C., et al. "Inhibition of p38 MAP kinase by utilizing a novel allosteric binding site." Nat. Struct. Biol. 9: 268-272 (2002). A 600-mg dose of doramapimod in humans strongly inhibited LPS-induced coagulation activation, as determined by plasma concentrations of the prothrombin fragment F1 + 2. Doramapimod also dose-dependently decreased the activation and subsequent inhibition of the fibrinolytic system (plasminogen activator inhibitor type 1, plasma tissue-type plasminogen activator, and plasmin-α2-antiplasmin complexes) and endothelial cell activation (von Willebrand factor and plasma soluble E-selectin). Branger, J., et al. "Inhibition of coagulation, fibrinolysis, and endothelial cell activation by a p38 mitogen-activated protein kinase inhibitor during human endotoxemia." Blood 101: 4446-4448 (2003). Doramapimod inhibits the protein kinases p38α and p38β and is undergoing clinical trials for the treatment of inflammatory diseases.